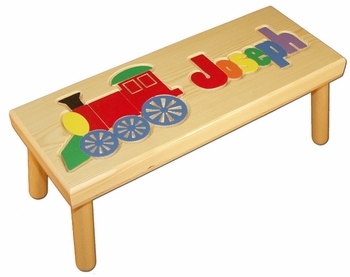 An enhanced version of our incomparable baby name seat, this model includes a built in 10 piece locomotive puzzle right next to the letters in the baby’s name! Terrific as a newborn gift and for first birthdays, here is an educational and very practical baby gift built to last a lifetime! Each is made in America and constructed with furniture quality solid Ponderosa Pine. The paint and wood finish are both water based and non toxic. The seat top measures 9 by 24 inches and stands 9 inches high from the floor. The letter puzzle pieces can be painted in primary colors as shown above or in pastel colors as seen by clicking on the More Images tab. Please note: There is an 8 letter limit for the name on this seat model.